Nasal obstructions can make breathing difficult but a skilled surgeon can use a rhinoplasty procedure to make breathing much easier. Besides cosmetic rhinoplasty, which is for appearances only, there is another type of procedure known as functional rhinoplasty. In this surgery, the surgeon seeks to improve the function of your airway without changing the contours of the nose. Some patients would fall into both categories. Many people have noses that are misshapen, which can cause abnormalities in nasal function. Side effects of airway obstructions include sleep disturbance, dysfunction of the Eustachian tube, sinus headaches, recurring sinus infections and nosebleeds. If the obstruction is not treated, you may develop obstructive sleep apnea, hypertension or insomnia. In cases that are not complicated, a surgeon can restore proper nasal function by treating the internal passages, while not altering the exterior of the nose. This procedure was developed to correct occasions where the dividing wall between your nostrils is twisted, bowed or bent. This results in blocking of one or both passages. Septoplasty utilizes surgical techniques that straighten the partition and open up blocked airways. This procedure does not take long – usually a half hour or less – and recovery is not difficult. Eliminating blockages in the interior of airways works for many patients. If you have a more severe form of airway obstruction, your surgeon may operate on the external framework of your nose. If your nose is pinched, collapsed or deviated, the problem will not be cured with internal surgery alone. In cases like these, your surgeon will use techniques of rhinoplasty to enlarge, reinforce and straighten the external nasal passages that are obstructed. This will give you an air passage that is unobstructed. Many cases of obstruction of external nasal airways are caused by the collapse of nasal valves. This area is the narrowest part of the airway, and it filters incoming air. The nasal valve normally will collapse during deep breathing, such as breathing during exercise. Otherwise, it remains open. In noses that have been altered by aging, surgery, disease or injury, the skeletal support for the nasal valve is not adequate and you may develop valve collapse. There are a number of sophisticated techniques used in these cases, but no one procedure works for everyone. Techniques should be chosen based on your variations in nasal contour, tissue strength and anatomy. Even if you would prefer a slender nose, you may have to be willing to accept the best your surgeon can do, while still allowing enough space for the passage of air. Cosmetic surgeons are also trained in the prevention of nasal valve collapse. Every year, thousands of people have nasal surgery. Some have it for cosmetic reasons, but other surgeries are used to correct breathing issues by removing obstructions. If you have these issues, consult a physician who is schooled in the function of nasal airways, as well as in plastic surgery. It is vitally important that the highest priority is efficient breathing. Is Surgery an Option for People with Chronically Stuffy Noses? If you suffer from recurring stuffy nose issues, you may have breathing problems that will not respond properly to standard treatments. When the blockage is related to nasal structure abnormalities, surgery may be a viable option. There are many nasal obstruction causes, states ENTnet.org. The septum may be bent or crooked, due to injury or abnormal growth. This may cause blockage in one or both passages. Surgery to correct these problems is considered functional, rather than cosmetic. Some people have both types of surgery at the same time. If you have questions about treating nasal obstructions with rhinoplasty make an appointment to see our rhinoplasty specialist. Within the nasal passage, there is a thin wall called the nasal septum. This wall separates the right and left sides of your nasal cavity. Ideally, the nasal septum should be centered between the two cavities. However, there are many individuals who have a deviated septum causing one nasal passage to be smaller than the other. Many people have displaced septums and do not realize it. If the offset septum is not causing any health issues, then there is no need to be concerned. However, if you are having difficulty breathing, are experiencing frequent nosebleeds, or have any other severe symptoms, it is a good idea to visit an ENT specialist who will able to offer an effective treatment plan. If it is found that you have nasal obstruction, you may be able to treat the problem with such things as adhesive strips or medication. If you have a deviated septum that is causing the symptoms, then deviated septum surgery is required. Laboured breathing during sleep – Normal breathing during sleep can become more difficult with a septal deformity. Noisy breathing when sleeping is especially common in young children or infants – and may be due to a deviated septum and turbinate enlargement. Frequent nosebleeds – Septal deformities can cause the septum to dry out, which increase the occurrence of nose bleeds. Difficulty breathing through one or both nostrils. Obstruction from a septal deformity can make it difficult to fully breathe through one or both nostrils. Facial pain – If the septum comes into contact with the outside wall of the nose, pain may occur. Chronic sinus infections – Frequent sinus infections may be a sign of a septal deformity. If you are concerned that you have a deviated septum, it is important to consult with an ear nose and throat doctor in order to begin a proper treatment plan. Your doctor will be able to assess whether or not deviated septum surgery is necessary. Individuals who are experiencing chronic congestion, blocked breathing through their nose, nosebleeds, sinus infections, and/or troubled breathing at night should seek the advice of an ENT specialist. In many cases, the problem stems from a deviated septum and/or turbinate hypertrophy. For this reason, it is common for ENT surgeons to perform septoplasty and turbinate reduction surgery in conjunction. The nasal turbinates are small structures within your nose that work to humidify and keep your nasal passages clean as air passes through to your lungs. When these turbinates are enlarged beyond normal size, nasal obstruction can occur. Many patients with enlarged nasal turbinates also have deviated septums. 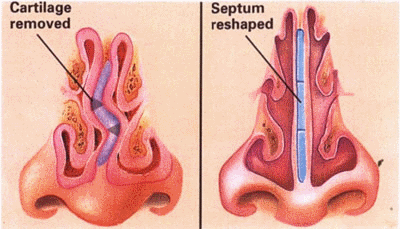 The septum is the thin wall of cartilage that separates your right and left nasal passages. If your septum significantly deviates from the center of your nasal passages, you may experience difficulty breathing or may develop other chronic problems. By straightening the septum through septoplasty and reducing the size of the turbinates (turbinoplasty), most patients find significant relief from their previous symptoms. Septoplasty and turbinate reduction surgery are performed using local or general anaesthesia. Most surgeries can be performed using local anesthesia with light sedation. However, for some patients, in particular young children, general anesthesia is more practical. Convalescence includes avoiding high-impact activities for a few weeks after the procedure. Ice packs will also help to reduce swelling and alleviate any pain felt post surgery. Your doctor will have additional advice depending on the extent of your surgery. It is important to follow this advice since the success of the procedure depends on both the surgery itself and post-surgery care. Factors such as only using the pain relief medication that your doctor prescribes are imperative for your health and for the recovery process. It is also important to follow up with postoperative visits to your ENT doctor to ensure that you are healing properly.